Moles can cause damage to a landscape, including turfgrass, small annual plants, and paver patios or walkways. They tunnel unseen through the top few inches of soil in search of prey, and leave a trail of damage behind them. In a lawn, the tunnels appear as narrow ridges that may have a small hole here or there where the mole popped its head out. In a lawn with a lot of mole activity, the surface may feel spongy as it is walked upon. These are tell-tale signs of a mole problem. Mole tunnel in a lawn. Many homeowners think that applying a grub control solution will deter moles. Unfortunately, this is not the case, though you will find lots of pest control companies in the Raleigh, NC area and sites all over the web that tell you this will work. You may also have heard this from some of your friends and neighbors. They say killing the food source of moles will send the moles elsewhere, but grubs are not the main food source of moles. While they do eat grubs, the main staple in a mole’s diet is earthworms. Moles also enjoy slugs, snails, centipedes, millipedes, and other juicy insects in your soil that are beneficial for your turfgrass and other landscape plants. Applying an insecticide that would kill all of the life in your soil would be a setback for your turfgrass and landscape plants, and most insecticides are either acutely toxic to people and pets or they are water contaminates. Crownover Green does not recommend applying insecticides to eradicate moles. We’ve had many clients who have had moles, and don’t know of any who got rid of the moles by killing bugs. The only proven way to eradicate moles is to kill the moles. 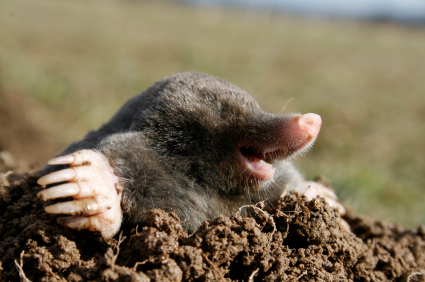 The hassle-free method for eradicating moles is to contact a professional critter control service that will have the expertise to trap or kill the moles. Beware that a general pest control company may offer grub control as the first step. When this method doesn’t eradicate the moles they’ll offer additional services at additional costs. Find a pro that addresses the problem directly. If you are a DIYer, there are several products available at garden centers. There are traps, gassers, and baits. If you don’t want to kill the moles and are not expecting total eradication, then you could try mole deterrents. There are sonic spikes and castor oil pellets or sprays. Whatever DIY option you might choose, follow the label instructions closely to get results. 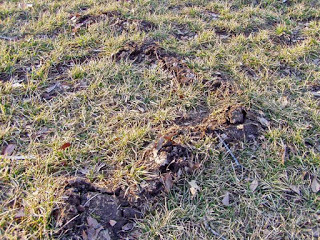 Moles become very active in late winter or early spring as the ground becomes soft. 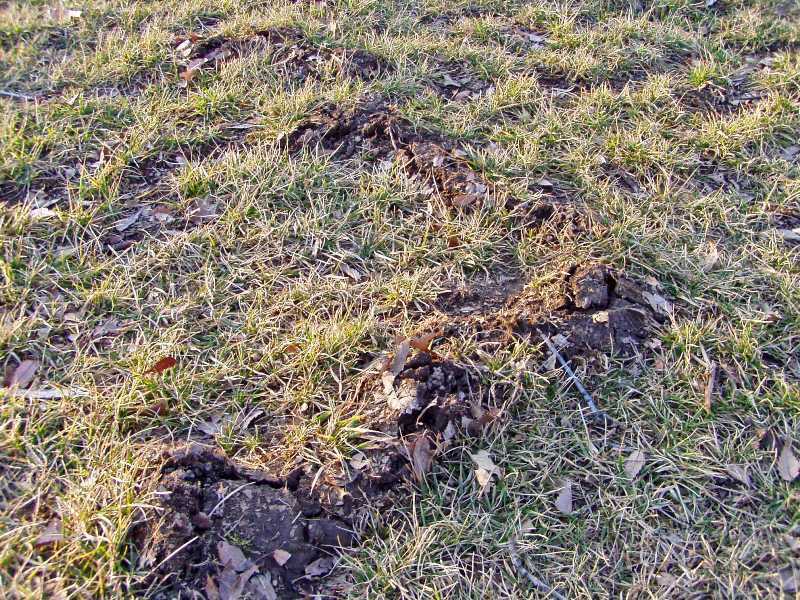 Spring is also mating season for moles so spring is a good time to get them under control. How often should I water my grass? The answer to this question is simple: Usually not more than twice per week unless you are establishing a new lawn with sod or seed. More frequent watering may be causing more problems with your lawn. Many people we talk with say they water twice a day, every day, every other day, or at least three times per week. If you are one of these people you may be enabling your lawn’s addiction to water and creating weed and disease problems. The frequent watering offenders tend to be those who have automated in-ground irrigation systems. The problem with frequent watering is not that you are using more water than necessary (although you might be). The problem is that by watering frequently, you may be preventing your turf from reaching its full potential for heat and drought tolerance. Furthermore, you are creating a more ideal environment for fungal disease and some of the most invasive and hard-to-control weeds that we see in Raleigh, NC area lawns. If you water frequently and briefly, then your turfgrass roots will have no reason to grow deeper because all of the water that the plant needs to survive is right at the surface of the soil. Whereas, watering deeply twice per week will encourage deeper and heartier root growth; and the deeper and stronger the roots are, the longer they will stay moist between watering, which will help the grass survive through the summer. Some of the most frequently watered lawns that we see in the Wake Forest, NC area have the worst problems with tough summer weeds including nutsedge, crabgrass, or spurge. Pathogenic fungi also love moisture. They develop on the blades of your grass, and the more frequently you wet your grass down the more likely you will be to eventually see a fungal disease which can kill large sections of your lawn very quickly. In mid-summer when daytime conditions are sunny and very hot a lot of water may be lost to evaporation. In the absence of rain you may wish to water a third time during a week. However, our recommendation for clients with automated irrigation systems is to set your sprinklers for twice per week in the morning, and manually run them a third time only when needed. For how long should I run my sprinklers? The answer to this question is not as simple because different types of sprinklers vary in the amount of water they put out in a given amount of time. There are different types of sprinkler heads that have varying rates of output and varying ranges of motion. Therefore the length of time your sprinklers should run depends on the particular sprinklers you use. Here’s how to determine how long to run your sprinklers. Put out a few soup bowls around your lawn. Then run your sprinklers to see how long it takes to fill them with the amount of water that your type of turfgrass needs. Zoysiagrass and Bermudagrass lawns should thrive on 1″ of water per week through the summer, so they should receive .5″ of water twice per week. Tall Fescue lawns need about 1.5″ of water per week, so they should ideally receive .75″ of water twice per week. 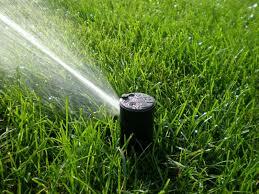 If you have an automated in-ground irrigation system, be sure to put bowls in the various zones of the system. If you use hose-end sprinklers, put the bowls in each area as you water. A water-saving strategy would be to irrigate at about 50% of the total amount your lawn needs and hope for rain to supplement your irrigation. If it does not rain, then you can manually run your sprinklers to make up the difference. Turfgrass that is watered well twice per week and properly mowed (read about proper mowing in a previous blog article HERE) will be healthier and look better through the growing season. If you have an immature lawn, you may need to water more frequently at first and work toward twice per week. During the winter homeowners oftentimes do not think much about their lawns, and certainly not about ugly weeds such as crabgrass until they start seeing them around Memorial Day. However, late winter, which is February meteorologically in the Raleigh, NC area, is when you should get started to help prevent weeds later this spring and summer. The first treatment of the year by Crownover Green is key to preventing annual weeds such as crabgrass and spurge that would otherwise sprout and grow throughout the summer. By mid-March we will apply our weed pre-emergent, which essentially provides a barrier on top of the soil that prevents weeds that sprout from seeds from growing. When a lawn is free of debris and excess dormant top growth, more pre-emergent coats the soil and is therefore more effective at preventing weeds. Here are a couple of basic tasks that will help you prepare your lawn to look its best later this summer. If your lawn is littered with tree branches or pine cones that are too large for your mower to shred, pick them up. and put them at the curb for yard waste pick-up. Before weed pre-emergent is applied, set your mower height lower than usual and mow the dead growth and other debris in your turf. It is best to bag and remove the clippings. Shorter top growth will allow the pre-emergent to reach the soil where it needs to be in order to work. After the first mowing, raise your mower blade a notch or two and let your grass grow this spring. Some organic debris left on the lawn is good as it decomposes and returns nutrients to the soil. However, too much of it may smother your grass as it begins its growing season this spring. If there is still a lot of debris on your lawn after mowing, we recommend raking it off. Winter can be hard on a lawn, even in the Wake Forest, NC area where the cool season is typically relatively mild with short periods of freezing temperatures. Along with sometimes frigid temperatures will come browning of your turf. Is brown grass during wintertime healthy grass, or is it a sign of a problem or deficiency? Most plants experience color changes during winters in our transitional climate zone, and all of the turfgrasses that are common in our area experience some degree of browning. Bermudagrass and Zoysiagrass, which are the most common warm-season turfgrasses in our area, turn sandy tan in color during dormancy from late fall through early spring. This is normal. There is nothing that can be done to keep warm season grasses from turning brown in winter, although some people who do not like the dormant color of their lawn choose to “paint” their brown grass green or overseed with a winter ryegrass, which is green. Bermudagrass is usually totally dormant during the winter and it is hard to damage. Extremely cold temperatures or heavy use of a dormant lawn could potentially cause some winterkill (loss of turf) of Bermudagrass, but this is unusual, and Bermudagrass will typically rebound well from winterkill. Zoysiagrass, while appearing to be dormant like Bermudagrass during the winter may not be fully dormant. It may still be vulnerable to winterkill from frigid temperatures, fungal disease, and heavy traffic during moist conditions. Zoysiagrass also rebounds reasonably well from winterkill, but maybe not as robustly as Bermudagrass. Large areas of damage to Bermudagrass or Zoysiagrass due to winterkill may require re-sodding or seeding. Fescues, both Tall and Fine Fescues, are cool-season turfgrasses that are semi-dormant during Wake Forest, NC winters. They are more tolerant of frigid temperatures and do not usually experience winterkill in our area. 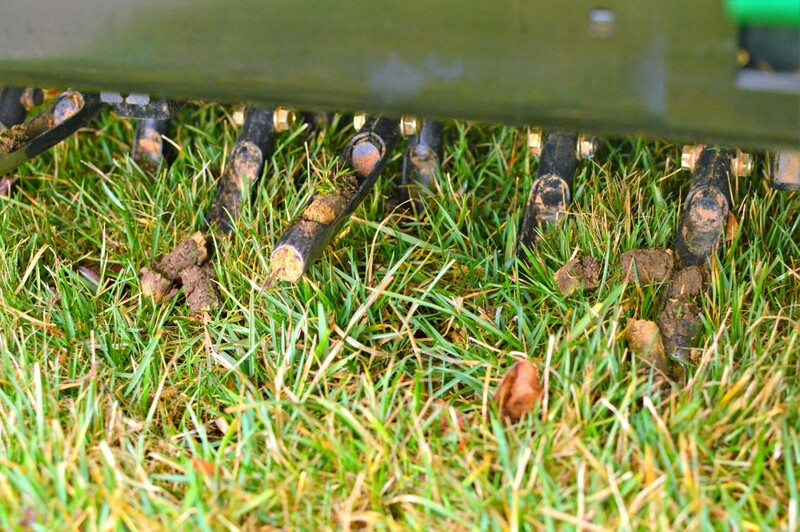 During winter, Fescue grass blades do not grow much, but the root system may continue to grow except during the few coldest weeks of the winter. Fescues tend to retain some green color during the winter, but yellowing or browning is normal. Some homeowners may notice variations in the amount of green from one Fescue lawn to the next within the same neighborhood. Lawns that are greener than others during winter may be the result of high levels of nitrogen fertilizers being applied to those lawns in late fall. At Crownover Green, we do fertilize in the fall but will not overdose a lawn with nitrogen for the sake of color. When a lawn is overdosed with nutrients late in the season, the grass is unlikely to use all of the nutrients that are applied and the excess nutrients either leach into our groundwater or run off into our waterways. This potential for over-fertilization of lawns contributes to dead zones in our waterways and waterbodies. Will My Brown Lawn Turn Green Again? Browning of turf during winter in our area is normal, and every type of turf generally returns to its beautiful green color in its proper time. Because we cannot control nature, we cannot guarantee that your lawn will totally escape winterkill. However, widespread winterkill is rare in our area, and we do guarantee that we will work with you to get your lawn looking beautiful again as quickly as possible if it sustains any damage whatsoever during the winter. Why do weeds still emerge even after you apply a pre-emergent herbicide? Weeds that spread via their root systems (creeping roots, bulbs, tubers, stolons, rhizomes) will not be affected by pre-emergent herbicide. They will keep spreading year after year if they are not properly addressed. Pulling them out by hand may not be effective due to their strong or expansive root systems, which will promptly regenerate new weed plants. Short of digging them up and replacing these sections of your lawn, the most effective way to eradicate them is to spray them with a post-emergent herbicide (preferably organic or reduced risk synthetic); and depending on how robust their root system is, it may take multiple applications throughout a growing season to get rid of them. Some weeds that spread via seed are biennials (e.g., dandelions), which means that they don’t spread seed until their second year of life which is after a first year in which they become a well-established plant that is not affected by pre-emergent herbicide. If they are in their second year of life, they must be pulled out by hand or sprayed with a post-emergent herbicide. The timing of when you apply the pre-emergent may not be in sync with when the weeds germinate. If you apply it too late, some seeds in your lawn may have already germinated and grown beyond the point at which the pre-emergent will kill them. If you apply it too early, the residual effects of the pre-emergent may be reduced before certain weed seeds begin to germinate. Well-timed application is critical. You need to know the soil temperature at which certain weeds begin germinating and apply the pre-emergent then for maximum impact. Weed seeds that are deposited in your lawn by natural processes after the pre-emergent was applied may not be affected by the treatment. Weed seeds are being deposited in your lawn every day throughout the year by wind, birds, and other wildlife. Seeds may also be transported to our lawns inadvertently by our children, pets, and ourselves. With so many reasons why weeds might still grow despite applying a pre-emergent herbicide, you may be wondering if it makes sense to apply one at all. At Crownover Green, we believe that it is especially worthwhile to apply a pre-emergent on lawns that are thin or on which the weeds were not well managed the previous year in order to thwart certain aggressive and invasive weeds in a lawn. Your lawn may contain hundreds or thousands of weed seeds that are lying dormant during the winter. As the soil temperature rises, these seeds begin to germinate and grow. If a pre-emergent herbicide has been properly applied, many of these tiny plants will be terminated and you will never notice them. Why is my Bemudagrass so thin in some places? Almost every Bermudagrass lawn that we encounter has areas where the grass is thin. What do these lawns have in common? Shade. Bermudagrass needs full sun all day in order to stay thick. If you have a Bermudagrass lawn, then you have probably noticed this phenomenon. Your Bermudagrass lawn is most likely a hybrid type. Real estate developers in Wake Forest, NC today seem to prefer hybrid Bermudagrasses to other types of grass probably because they are relatively affordable and establish easily from sod. Hybrid Bermudagrasses make a very attractive lawn when cut at the proper height (about 1.5″) and frequency (about once per week), when they receive adequate water (about 1″ per week), and when in full sun (about 8 hours per day). The great thing about Bermudagrass is that it will take a lot of abuse. Cut it improperly or infrequently, let your kids and pets rip and tear on it all summer, neglect to water it. While it may look a little ragged under these circumstances, Bermudagrass will usually survive, and even better, it will repair itself because it spreads aggressively by both underground stolons and above ground rhizomes (runners). Here’s the bad news: It won’t look as nice in areas where it receives shade at some point during the day, and it doesn’t stand a chance where there is less than about six hours of full sun exposure per day. Lawn areas that are typically thin on a Bermudagrass lawn due to shade are those against the foundation of your house or fence, and under or near trees and shrubs. If your house is within 25-30 feet of your neighbor’s house, the Bermudagrass may be thinner between your houses. Southern exposures of your property are exceptions because they tend to receive more sunlight. What are some other options for areas that receive less than 8 hours of sun per day? Along foundations, fences, and natural areas, or under the branches of trees in your yard, consider non-lawn features such as shade tolerant shrubs, perennial flowers, or ground covers. For larger areas where you would like to have a lawn, choose a different type of grass. Most Zoysiagrasses and a couple cultivars of Bermudagrass may do okay with 6-7 hours of sunlight. Tall Fescue does well with 5-6 hours of sunlight, but it is a cool-season plant that will not match your Bermudagrass well. Fine Fescues are known to survive with as little as 3-5 hours of full sun. One of the most important things you can do to help keep your grass thicker and greener while minimizing weeds and fungal diseases during the stress of summer is to mow it at its proper height. The proper height for Fescue is 3″-3.5″. The only times we recommend cutting it lower is the first time you mow in late winter and just before your fall renovation. A little shorter in the spring and fall when temperatures are consistently below 80 degrees is probably ok, but not too low or you may be compromising root growth during critical periods when your turf needs to build its strength. When daytime temperatures start flirting with the 80 degree mark, it is time to raise up the mower deck. Keeping Fescue grasses long has several benefits. It shades the soil from the sun, which keeps your grass’s roots moist longer. The shaded soil also prevents some weed seeds from germinating and sprouting. In our experience, homeowners who mow their lawns lower than 3 inches usually have more weed problems. Cutting Fescue higher reduces the stress on the turfgrass plant, which makes it less susceptible to fungal disease and drought stress. 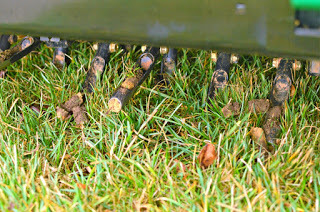 Keeping the grass higher, allows the turfgrass plant to focus its energy on growing deeper, stronger roots rather than on recovering from close cutting. While some people have a preference for a shorter lawn, in our experience Fescue lawns that are mowed higher stay nicer through the growing season than those mowed lower, which tend to suffer more damage from heat, drought, and disease during the summer. If you mow your own lawn, set your mower at 3″-3.5″. If a lawn service is cutting your grass too low, ask them to cut it higher. Hand-pulling – Pulling weeds is the safest, most effective way to eliminate them and it provides instantaneous results, which are some of the reasons why hand-pulling weeds is included in the Crownover Green Lawn Treatment Solution. 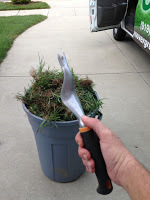 There are a variety of weed pulling tools ranging from less than $10 for a very basic hand tool to about $50 for one that enables you to pull weeds without even bending over. These tools are especially useful on weeds such as dandelions that have a deep taproot. Pulling all of the weeds on your property may not be a viable option, and certain weeds cannot effectively be selectively removed from turfgrass. Weed Torch – A weed torch, which is powered by small propane canisters, can be purchased for less than $50. Burning weeds is effective, provides instantaneous results, and involves less elbow grease than hand-pulling. However, there is an obvious safety concern. Please be careful. Boiling Water – Yes, water. Boiled. It’s actually very effective and works quickly, but is only practical if you have just a handful of weeds to kill. If you have a lot of weeds, it could take a while to boil enough water to kill them all. Also, please be careful. Vinegar – Pour vinegar into a spray bottle, add a couple drops of dish soap, and spray it on your weeds on a hot sunny day. The soap helps the vinegar stick to the foliage of the weed and many weeds will shrivel within an hour our two. Grassy weeds, not so much (although don’t spray it on the grass you want to keep), and waxy broadleaf weeds will need a follow-up application. The advantages of vinegar are that it is cheap, fairly safe, easy to get, and quick to apply to a large number of weeds. Other Safer Sprays – There are several organic liquid products on the market, and the big box garden centers stock a couple of them. At some local garden centers or online you can find 20% horticultural vinegar, which is four times stronger than common household vinegar, or products that contain citric acid, cinnamon oil, clove oil, or herbicidal soap. There is not necessarily one best choice for killing weeds. Choose the one that will work best for you based on your budget, patience, and overall preference. And please note that a substance capable of killing an unwanted plant might also kill a desirable one, so be careful when applying it near turf or ornamental plants. Yes, we do pull weeds. From the lawn. With our hands. All sorts of weeds: bittercrest, chickweed, dandelion, crabgrass . . .
Weeds pulled in Wake Forest. Pulling weeds seems to be an unfamiliar practice these days, and especially for a lawn treatment company. The gold standard in professional lawn treatment is to identify the most effective mixture of chemicals to quickly kill everything in the lawn except the grass. We reject this standard because repeatedly spraying a cocktail of chemicals is, well, unwise. So, Crownover Green is revolutionizing professional lawn care by actually pulling some weeds by hand. We do it because it is not only the safest way but the best way to eliminate weeds from a lawn. There is no chemical that will make a weed disappear quicker than by a pluck with a thumb and forefinger. There are some herbicides that are much safer than the typical chemical cocktails and we use them, but judiciously, and with the ultimate goal of developing a thick carpet of grass with so few weeds that they can be managed with hand pulling and minimal spraying. Pulling weeds . . .
. . . is safe. No harmful chemicals are involved.
. . . is free.
. . . is gratifying. The results are instantaneous.
. . . is really not that hard. Squat, grab, and pull.